Enter the atmosphere of a hotel restaurant full of colors and flavors ! Enter the atmosphere of a hotel restaurant full of colors and flavors! First the scenery! A setting of ocean and beaches dominating the beautiful pedestrian square Bellevue. There, on the square, Le Café de Paris, the only hotel in Biarritz where all rooms have sea view, invites to all trips: relaxing, captivating, gourmand and transatlantic. An Art Deco Style ... The art deco style inspired by the Normandy steamer, considered one of the most beautiful ever built, offers a never-weary cruise rhythm. 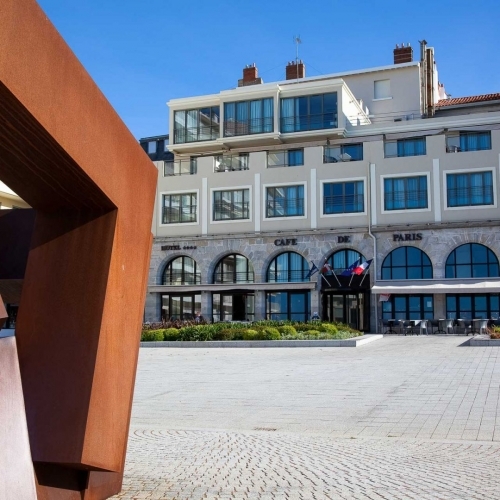 Ideally located in the heart of Biarritz, yet quiet, the hotel and its restaurant offer refined spaces combining discreet luxury, sleek design, clarity and top-of-the-range amenities. All this to ensure a colorful stay between the ocean and the Pyrenees. Just a stone's throw from the Café de Paris, the Bellevue congress center, the casino, the sumptuous villas of the 19th century, golf, sandy beaches, surf spots, joys of sailing ... the Basque Coast in all its glory !